Planning to throw a Halloween party? 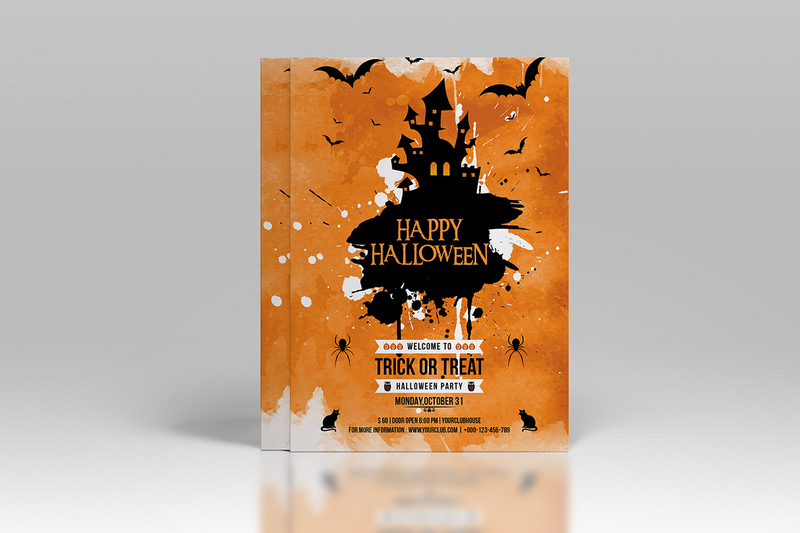 DesignContest knows several secrets of a gorgeous Halloween flyer design. We’ll gladly share them with you. Take a look at this collection of Halloween flyer designs and we’ll explain their strongest points to you. Mystery, gloomy colors, and a really frightening clown – isn’t that a secret of a successful Halloween flyer design? Judging by the following Halloween invitations design, it really is. Following the latest events, one can bet that this year’s most popular Halloween costume trend is going to be Pennywise, a scary clown from Stephen King’s novel. So, why not to use this winning tendency for your own gain? Popular and spooky characters on the pick of their popularity will attract people’s attention immediately. When Jack-o’-lantern is on fire – that’s something worth watching, right? What comes to your mind when you think of Halloween? In most cases the first thing you associate with this holiday is a pumpkin with a smiley (and a bit scary) facial expression. The strongest point of this design is in its color combination. With the help of complementary colors, this Halloween flyer design gets an emphasis on the foreground, placing there the brightest elements. Bats, spiders, black cats, pumpkins, and ghosts. These are the main symbols of Halloween. They are like the very attributes this holiday cannot do without. 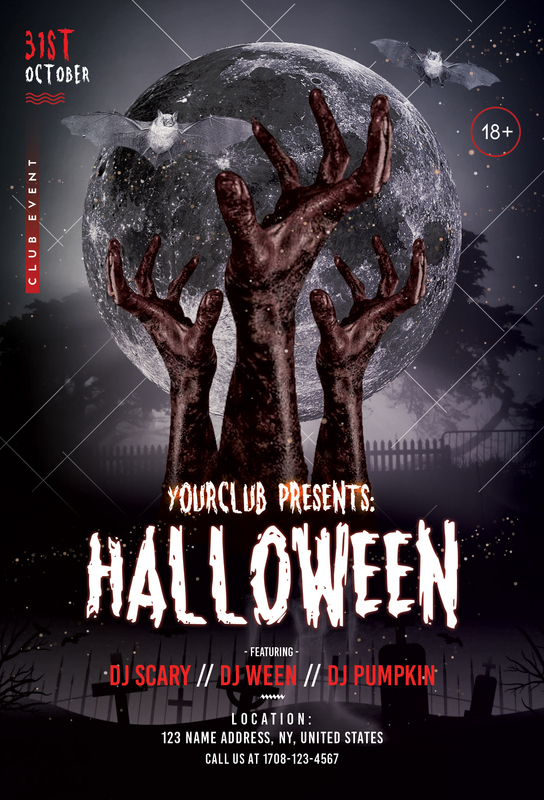 If you take a look at the Halloween party flyer designs created by Mukhlasur Rahman, you’ll understand that these elements aren’t the one thing in common those flyers have. In addition to them, there is also a wide range of Halloween fonts used to attract everyone’s attention. What’s more, all the information about the upcoming event on Halloween flyer designs is mostly given either in the center of the flyer or at the very bottom of it. This way, it’s easier to draw people’s attention to the details you want to make an emphasis on. You may also wonder how many fonts should be used for a Halloween flyer design. This question is rather controversial. On the one hand, using one font can guarantee that your Halloween flyer design is going to be clean and sound. On the other hand, combining fonts may bring you to highlighting the things of a greater importance. 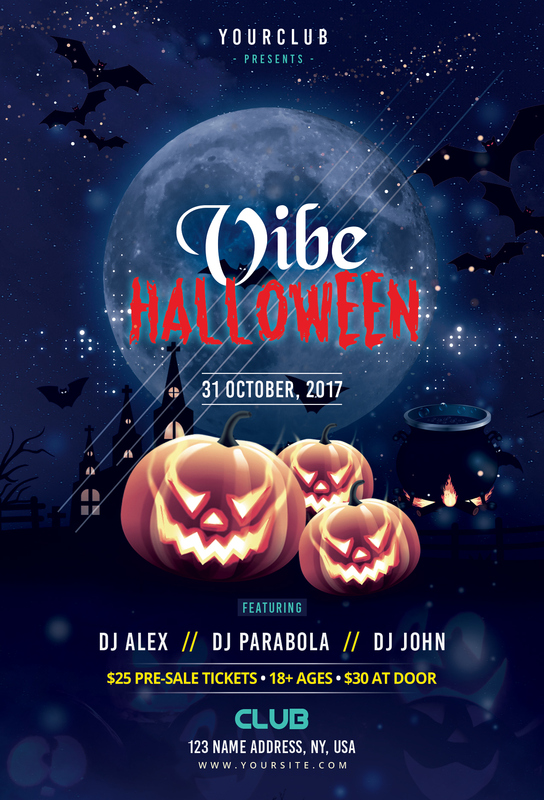 If you aren’t sure whether the fonts you choose for a Halloween flyer design can complement each other, there are different apps and software on font combinations that will help you a lot. Canva, Typ.io, Fontpair etc. are only three examples of dozens apps existing. In addition to that, if you’re going to create a stunning Halloween party flyer design, you also need to think of a color combination you choose for it. Surprisingly, you may have a sigh with a relief here. 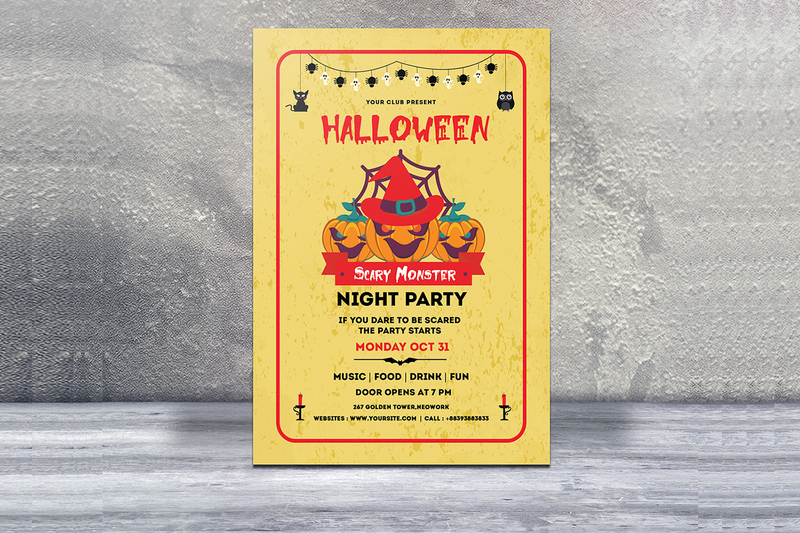 When it comes to Halloween flyer designs, there are to most common options designers follow: either using dull spooky colors, or working with warm yellow and orange shades. Of course, you may display your creativity by implementing other colors, by why to reinvent the wheel? In case with Halloween flyer designs, people associate the shades mentioned above with this very holiday. It’s all about the strong bond that leads to Halloween. Also, pay attention to the fact your Halloween flyer design should be ready for print. 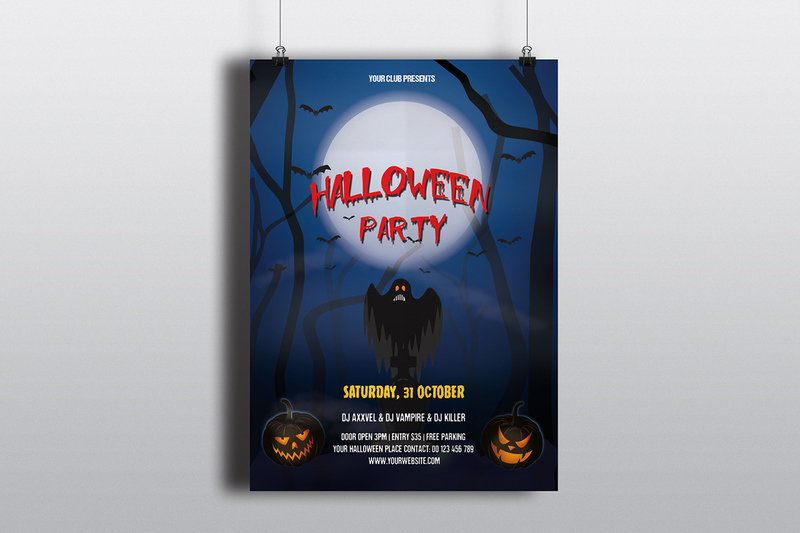 Check the files’ format and size to make sure there won’t be any unpleasant surprises when your Halloween party flyer designs will be finally printed. 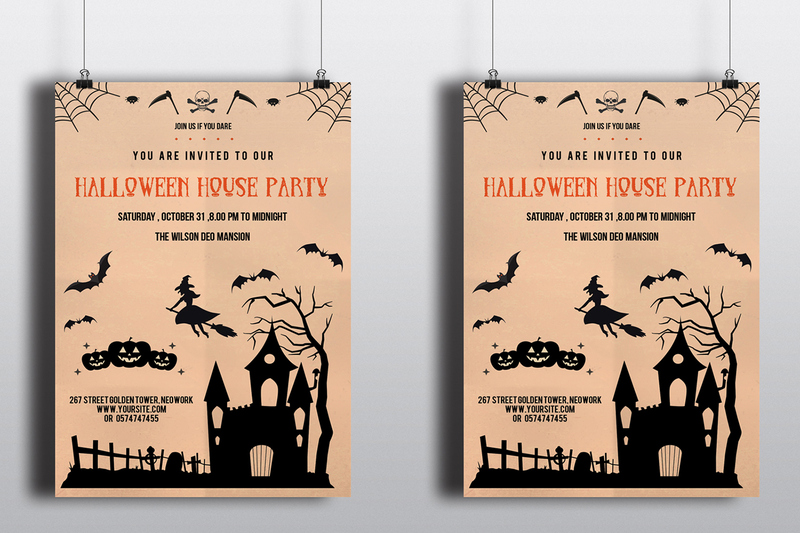 How spooky should the Halloween party flyer design you’re creating actually be? This question doesn’t have any precise answer. However, the more frightening your design is, the more interest it can awake. Which is why don’t be afraid to add scary elements to your flyer design (remember, “scary” doesn’t mean “repellent”). 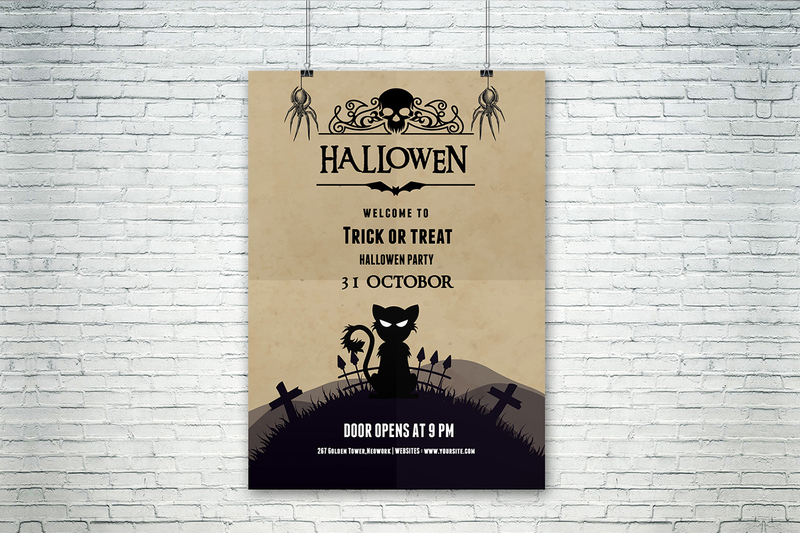 Now, what should you do about pictures and icons you use for your Halloween flyer design? As far as we live in the civilized society, you should respect others’ work and copyrights. That’s why, if you need any free icons or images, check out photo and icons stock that offer some stuff of the highest quality completely free of charge. 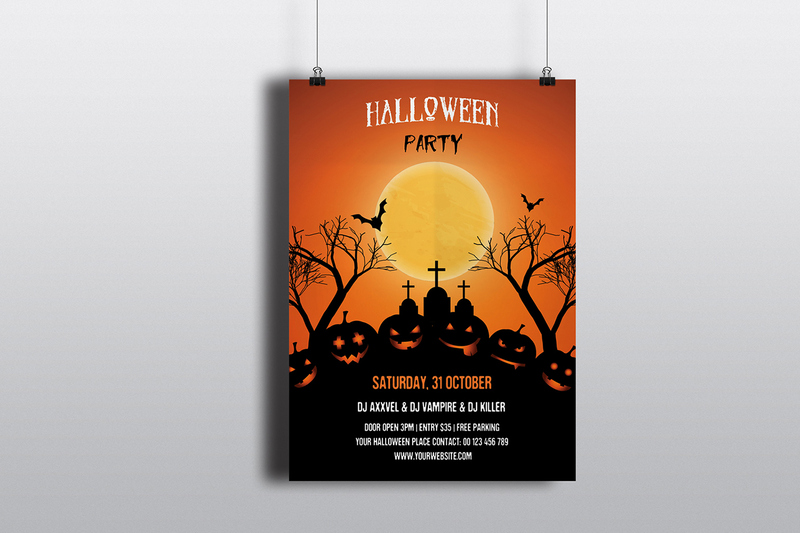 *All Halloween flyer design ideas found on Behance.